Last night, after a day of conference watching, I was reviewing in my mind the story of my conversion. I went through the earliest event that revealed my lack of religious training at age 8 that started me on the path of searching for Jesus. I recalled the major steps along the way to finding and accepting the restored gospel at age 16. I recollected the key moments where my fledgling faith was turned from skepticism to the determination that I truly had found that which I had been seeking for 8 years that would see me through the 40+ years that have followed and bring me to where I am today. Then, this morning, the talk by Bonnie Oscarson, General Young Women President, accentuated that story and how I must never lose the wonder that I had my inaugural year in the church of glorious, unimagined truth and blessings unfolded weekly. I currently live in downtown Salt Lake City. I can see the temple spire from my back porch during the winter when the trees are leafless. I walk my dog in the park kitty-corner from the church office building. I see on a regular basis general authorities, Sister Oscarson is in my stake. The grandson of LeGrand Richards is in my stake presidency. I am friends with many current members of the Mormon Tabernacle Choir, and I sing in a ward choir sprinkled with former members of the Mormon Tabernacle Choir. A general authority just sealed my son to his bride in the Mount Timpanogos Temple, pronouncing unspeakable blessings on their union according to their faithfulness. The Salt Lake Temple is steps from my home. My stake has it's conferences in the Tabernacle. At times I am absolutely certain that I lose perspective of how great these blessings are. Sister Oscarson's address, on the heels of recalling my conversion, reminded me of the awe I must feel for the knowledge I was first introduced to in 1975, and how amazed I was, every week in Sunday School, as I had revealed for the first time one astounding doctrine after another, and how I must never forget how blessed I am. As President Uchtdorf began his conference address, I had a sense this was going to be something to pay very close attention to. His message was to me most particularly powerful. He painted a clear and dramatic picture, a series of pictures, all which lent themselves to keen relationships to gospel truths that overpowered my emotions - the windows of heaven opened as I felt God's love, and messages for me. The soul that leans on Jesus can and will be restored to it's eternal, though forgotten, reality. The story of the decimated church in Dresden that was later rebuilt, and how much moreso the jewel of a human soul can be restored by Christ, again, reminded me of my own lost soul. I was the lost sheep. I sought him with no success. Then, he found me where I would not have known to look. I loved the description of the anvil and the hammer in contrast to the Lord's way, of not pounding us into a new shape but revealing our true selves to us, through living his commandments. I saw a beautiful and pure precious metal and jeweled crown progressively coated with dirt and sludge by the processes of mortal life till it was encrusted with layers of filth and completely unrecognizable for what it really was. Then I saw the gospel and obedience to the commandments as a cracking off of the filthy shell and a cleansing bath to once again reveal the sparkling jeweled crown beneath in all it's glory. I pay extra at my apartment complex to park my car in covered parking. Unfortunately, there are other cars that park above it in the open air and cracks in the pavement there allow rain to drip down through the dirty asphalt and concrete onto all the cars below. Even one day of that dripping dirty water leaves a gritty coating on my car. I'd have to wash my car every day to keep it bright and shiny. Likewise, the world splashes on us constantly all manner of muck, and we cannot "retain a remission of our sins" without an equally constant effort of gospel living and repentance and renewal of covenants, as discussed by Elder Bednar in his Saturday talk. Though we may have once recognized our divine heritage, unless we are diligent, we can once again lose all sight of our true nature. 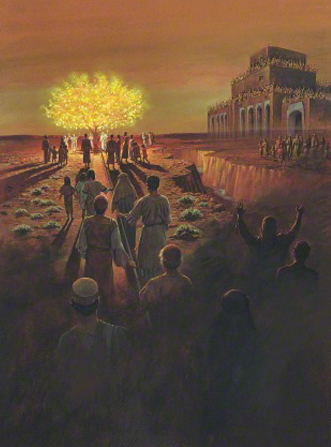 I thought of the rod of iron and the tree of life, mentioned in two talks this morning, and the precious fruit and the scornful pointing fingers and mocking from the great and spacious building. Oh how real that building is in our world today, and it is growing exponentially. I have been keeping track of the statistical reports given annually during the Saturday afternoon sessions of April Conference. I added this year's statistics to a chart started in 2003. There were some disturbing numbers I noticed, compared to prior years. The number of convert baptisms has gone down almost 40,000 in one year. 2015 was a very rough year. Children of record have gone down after a peak year in 2012 from 122,273 to 114,550 in 2015. The typical growth in total membership per year is going down - almost 80,000 since a peak year in 2012. Not only are fewer people joining the church, but more are leaving. The mocking scorn of the great and spacious building is apparently overpowering many, several in my own circle of acquaintances. No one is immune. I am not immune. Nothing can be taken for granted. Complacency cannot withstand the opposing forces in today's world. I am grateful for my membership. I am grateful to know the truth of my divine identity. I am grateful for the restoration of the gospel. I am grateful the Savior found this lost sheep. I am grateful for dedicated leaders who relay inspired messages to us from God on a regular basis during general conference and I am grateful to have such easy access to them as we now enjoy. And I am grateful for the chance to write about my feelings here.